Not all twins walk side by side…..
George’s Legacy was founded to offer emotional support and advice to bereaved parents in Lancashire and beyond. If you would like to make a donation, or would like to knit clothes or blankets for premature babies, please contact me using any of the information below. Coming Soon - Our Events Section! 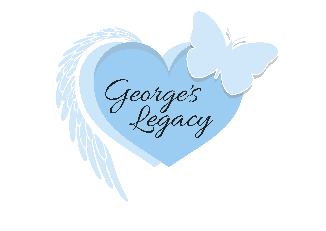 Our aim for George’s Legacy is to provide every local hospital with a cold cot so families can spend as long as they wish making memories with their baby and that every hospital has a home-from-home bereavement suite. We understand from a parent’s perspective the shock and grief of your loss, as you are suddenly faced with decisions you never expected to make. We support with making memories with your baby, such as baptism, bathing, dressing, photographs, bringing baby home and help with funeral arrangements or any other wish you may have for your baby. Only a parent that has been through this experience will understand how important these memories can be as part of your grieving journey. All aspects of our service are confidential and your wishes for your baby and your family are paramount to us. Whatever you need, we are here to help. We also fundraise for individual families to provide grief packages, clothes and blankets for premature babies, help towards funeral costs and headstone costs.